Imagine what Bill Monroe might be doing today if he were 30. Just as he did some 70 years ago, he might be revolutionizing the role of the mandolin in modern music, and sometimes singing in a falsetto, while fronting a modern quintet featuring only the best musicians on mandolin, guitar, banjo, fiddle, bass and harmony vocals, while mostly, but not always, performing original material. While Chris Thile may never have meant to evoke such a comparison, the parallels can’t be denied. A 21st century version of the Bluegrass Boys is exactly what Thile ended up with when he pulled some musician friends together for his 2006 album How To Grow A Woman From The Ground, and ended up fronting a band called Punch Brothers. After a couple of personnel changes since that album, Punch Brothers – banjo player Noam Pikelny, guitarist Chris Eldridge, Thile’s childhood fiddler pal Gabe Witcher, and bassist Paul Kowert – have received Grammy nominations, backed up country star Dierks Bentley, and released acclaimed recordings, including the new Who’s Feeling Young Now. 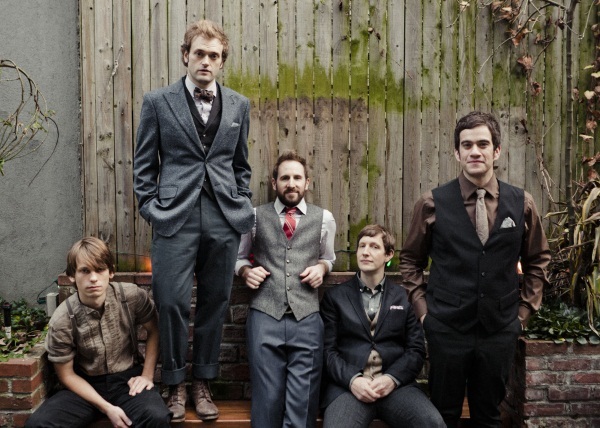 Punch Brothers have become the present-day equivalent of Monroe’s outfit, taking acoustic music to the masses via stage and television just as Monroe and crew did via the Grand Ole Opry, Bean Blossom, and whatever radio show would have them. And in an era where many of today’s performers look like they just crawled out from under their tractors, Punch Brothers, like Monroe’s band, even wear ties. Having played music professionally for some two decades, first with Nickel Creek and now with Punch Brothers, Thile has developed an almost organic approach to how music is made and how songs are written. Punch Brothers don’t worry a lot about things like A-B-A-B-C-B structure or if an intro is too long for radio. They just get together and create. Take away the songs, though, and you’ll have a group of men who are all acclaimed instrumentalists, who manage to live up to the review hyperbole of titles like “The World’s Greatest Mandolinist” or “Groundbreaking Banjo Player.” To create their one-of-a-kind sound, Punch Brothers use a combination of top-quality, and sometimes rare and vintage, acoustic instruments whose sounds are enhanced by the technology of today. “I’m using a K&K ‘twin internal’ pickup that Joe Glaser in Nashville set up for me,” he continues. “I didn’t want to enlarge the soundhole, I didn’t want to change the wood. So I had him make a new endpin that we fed a wire to the pickup out of and we mounted a quarter-inch jack on a Tone-Gard.” Thile uses Blue Chip picks and Elixir strings, and he and the rest of the band sing through Shure SM58 microphones. On his 2004 solo album Deceiver, Thile played more than 30 instruments, but doesn’t really have much to say about any of them, or whether or not he might play a different instrument on a future Punch Brothers recording (though he did play some guitar with cellist Yo-Yo Ma, fiddler Stuart Duncan and bassist Edgar Meyer on The Goat Rodeo Sessions).